With a full 7 oz. 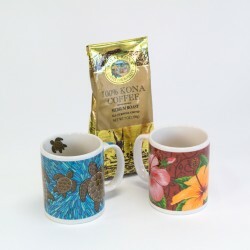 of 100% Kona coffee and two Hawaiian print coffee mugs, there is enough Kona coffee for the whole family. 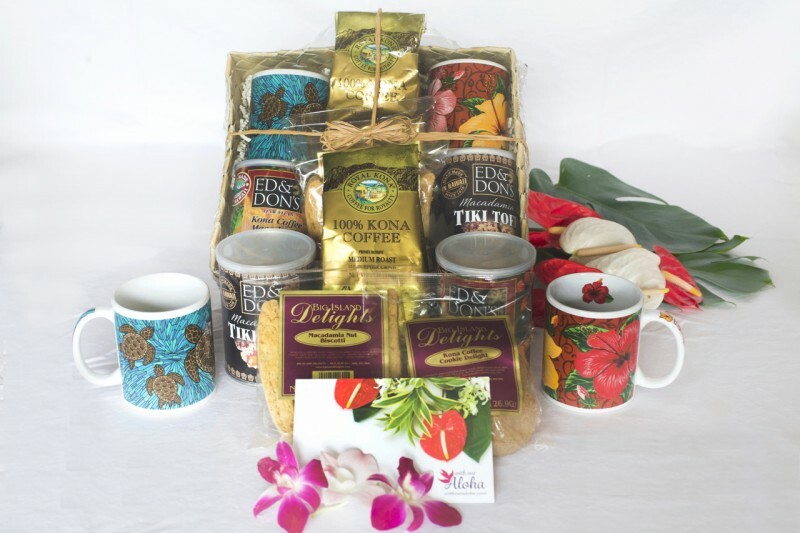 Perfect for the couple who just can’t get enough Kona coffee. 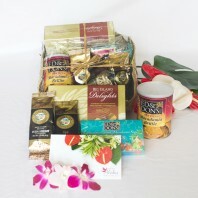 We pack all of these Hawaiian coffee items and pack in a this Kona coffee gift bag along with your personal gift note. Many couples start the morning with a rich cup of coffee. Whether on the way to work or lucky enough be on a Hawaiian vacation. 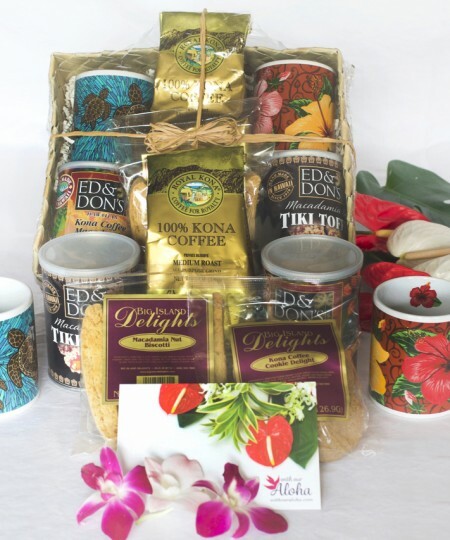 This thoughtful gift is a way for couples to share our special Hawaiian Kona coffee. 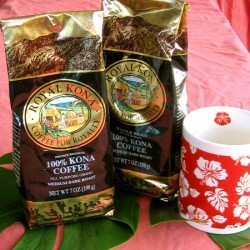 The coffee is one hundred percent Kona, not a less expensive blend. So even the most casual coffee drinker will notice the unique flavor. 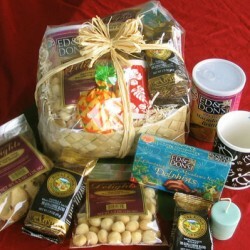 This Hawaiian gift also contains a pack of crispy cookies locally made with infused our Big Island coffee. 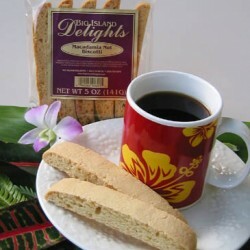 Biscotti are a favorite of coffee drinkers everywhere. These twice baked treats a chocked with Hawaiian macadamia nuts. Enjoyable on their own or dunked right in the coffee. Also perfect for sharing are our delicious candies. Tiki toffee is a local confection seldom found on the mainland. It is sweet with chocolate and a light crust of macadamia nuts. 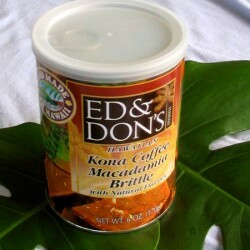 And as a variation of classic American peanut brittle is a delicious brittle made with coffee and macadamia nuts. 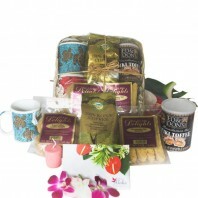 Long after these treats are shared your special couple will each have a Hawaiian coffee mug. 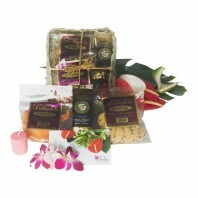 This will serve as a reminder of your gift and may evoke memories of a special time in Hawaii for the couple. 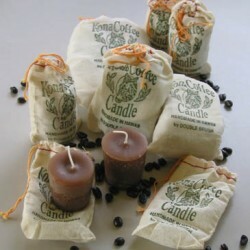 in a decorative Hawaiian print bag with gift wrap.